The thing about NYC is, there are just too many great restaurants! You can't possibly get to them all but it sure is fun trying! Here's my list of where you should be eating in the upcoming year, based on restaurants that I enjoyed in 2017. While it's far from comprehensive, hopefully it will give you some great ideas for your next meal out. I'd love to hear some of your favorites too. Leave a comment below. Cheers! abcV, 38 East 19th Street - Jean-George's first all-vegetarian restaurant is whipping up some flavorful, healthy dishes and it's open for breakfast, lunch and dinner. Read more here. Augustine, 5 Beekman Street - Keith McNally has another hit on his hands at his bustling financial district brasserie with all the signature McNally touches — warm lighting, faux vintage mirrors, hand-painted tiles of flowers and long, comfortable banquettes to settle into while sipping on an extra-dry gin martini. For dinner, choose a wine from the mostly French and American list to pair with the decadently delicious sea urchin spaghettini. I suggest the Hugel 'Cuvée Les Amours' Alsace Pinot Blanc which you can get by the glass or the bottle. closeup of the Sea Urchin pasta with king crab and pickled jalapenos at Augustine. 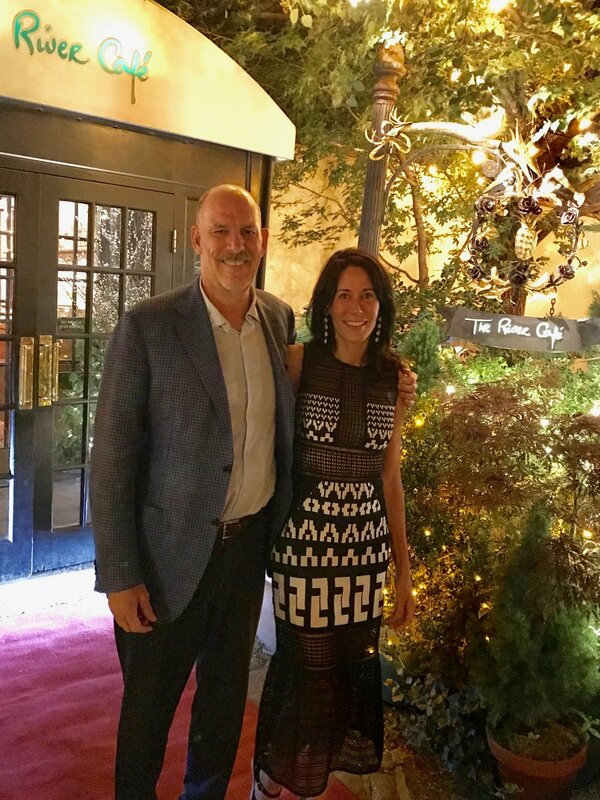 Aureole, 135 West 42nd Street - Joel and I dine at Aureole every year for our wedding anniversary and it always delivers an exceptional experience. 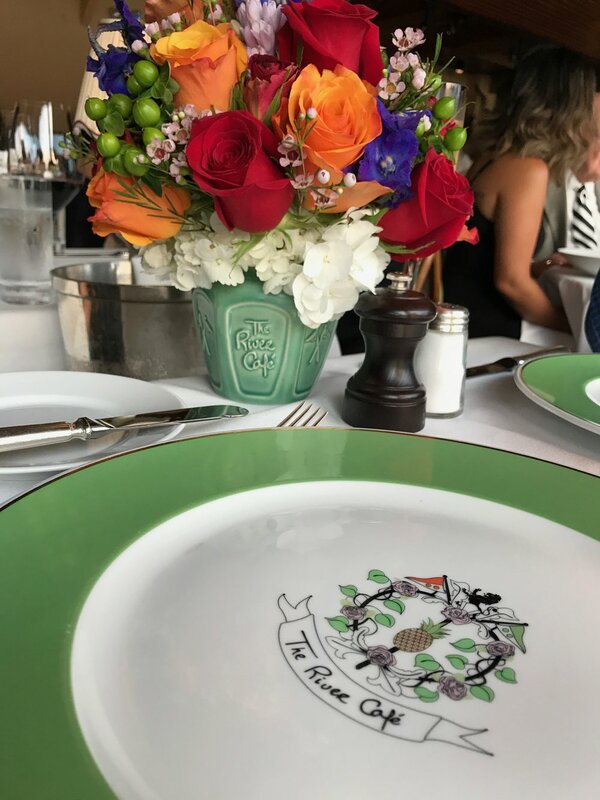 The original Upper East Side location may have been more charming, but the food and attention to detail is a constant year after year even in its contemporary Times Square location. You can find gems on the Aureole wine list like this Michel Gahier Trousseau, a light, earthy red that was a great accompaniment to the perfectly cooked fish. Ask Morgan Harris, head sommelier, for wine pairing advice. Babuji, 22 East 13th Street - Another restaurant with a new location but the same excellent, creative Indian dishes as before. Grab a beer from the cooler in the back of the room and settle in for an evening of tantalizing flavors. Order the kulfi "popsicles" for dessert! My girls enjoying the Kulfi dessert "pops" and the "golgappas" were one-bite wonders! Bond Street, 6 Bond Street - This restuarant has been here for 17 years and is still going strong with great cocktails and delicious Japanese fusion cuisine. Don't miss the tuna tataki. Boulud Sud, 20 West 64th Street - Close to Lincoln Center, this Daniel Boulud restaurant is still a popular spot for its refined setting and plentiful Mediterranean cuisine. Bowery Meat Company, 9 East 1st Street - I'm not much of a steak eater but the food here is really good and the restaurant has a great vibe. Start out the evening with the amazing ricotta with toasted pecans, chili, honey and mint served on grilled bread. Ricotta toasts and oysters with cheesy breadcrumbs at Bowery Meat Company. Cafe Altro Paradiso, 234 Spring Street - The wine list here always includes an interesting Verdicchio by the glass and I love sitting at the bar sipping on a glass of this appetite-stimulating white wine. You can't go wrong with any of the fresh pastas or the octopus appetizer. Homemade pasta with lots of cheese at Cafe Altro Paradiso. Casa La Femme, 140 Charles Street - You may not think a place with belly dancing and, during the summer, a fake grass floor would have good food but they do the authentic Egyptian classics very well. Make sure to try the dips – hummus and babaganouj — along with grilled lamb chops. Relax and enjoy the show with a signature fig martini or any of the fabulous cocktails made with my friend Pete Girgis' Qui tequila. Clay, 553 Manhattan Avenue (at West 123rd Street) - Locally sourced, seasonal food and an off-the-beaten-track list of wines is what you will find at this friendly, cozy, candlelit spot in Harlem. Perfectly al dente bucatini with lobster, bottarga, calabrian chile, basil and breadcrumbs at Clay. Craft, 43 East 19th Street - Still going strong after 10+ years, Tom Colicchio's elegant restaurant serves farm-fresh American cuisine. Cull & Pistol, Chelsea Market, 75 9th Avenue - This is my all-time favorite spot for the best oyster happy hour in Manhattan. Get there early (by 3:45 pm) on Mondays through Fridays to snag a seat at the bar. Order the house white wine of the day (usually around $28 per bottle!) and watch your oysters and other fresh seafood being expertly prepared. Every day there is a selection of 10 different fresh and briny oysters to choose from. Don't miss the "Pistols on Horseback' either, a warm oyster appetizer. Click here to read more! There's more to Cull & Pistol than oysters like this composed cold seafood tower of shrimp ceviche, and garlicky escargots, above. Dinosaur BBQ Harlem, 700 West 125th Street - My oldest daughter and I have a 15 year tradition of going here every December 23rd as part of our Fairway fish shopping excursion for Christmas Eve dinner. We start off by ordering a flight of interesting beers on draught and the fried green tomatoes. Solid barbecue and lots of great side dishes to chose from. Felix, 340 West Broadway - Fun French bistro serving the classics down in Soho. Favorite dishes: French onion soup, Murray's cheese plate, tuna tartare, escargot, salmon with lentils and the cassoulet. The Wine Chef can't get enough of escargots! Butter and Garlic was wafting though the entire room at Felix! Indian Accent, 123 West 56th Street - Upscale, creative Indian food with excellent cocktails in an elegant midtown setting. I Sodi, 105 Christopher Street - If you can get a reservation at this small, cozy, candlelit restaurant, go! The food is fresh, simple and delicious. If you can't get a reservation, try for a seat at the bar. They will take your name and call you when a bar seat is available while you're out exploring this fun area of the West Village. Keen's Steakhouse, 72 West 36th Street - this is an old-time, classic steakhouse with excellent steaks and more. There's a great, long bar to hang out at while trying one or more of the hundreds of whiskies available, neat of course! 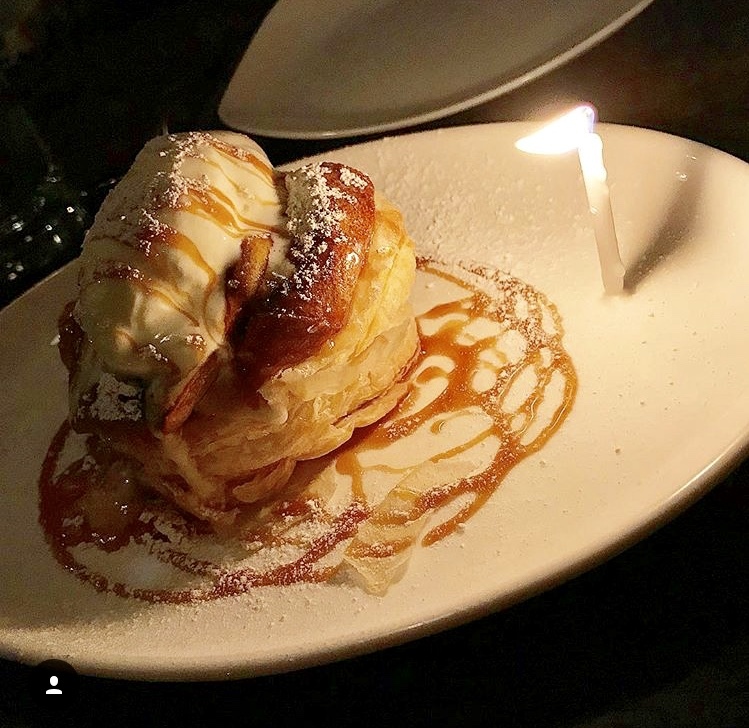 If you're in the mood for something sweet, order the fantastic creme brûlée — one of the best in the city — or the excellent key lime pie. La Esquina, (aka Corner Deli), 114 Kenmare Street - I just love this Mexican brasserie so much! The food is fresh and inventive and the scene is fun, fun, fun!! I always start the night off with a spicy jalapeño margarita. The tacos are amazing. Make sure to try the tortilla soup and the cheesy corn-on-the-cob! La Esquina's queso and pumpkin seed appetizer...¡¡Tan bueno!! Little Owl, 90 Bedford Street - This tiny restaurant in the West Village is very popular for its friendly service and delicious Mediterranean-inspired food. Homemade ricotta cavatelli with a kale pesto and tomato concassée at The Little Owl. Loring Place, 21 West 8th Street - Lots of market-driven and locally sourced dishes at this popular new spot in the heart of Greenwich village. Fluke crudo with citrus, chilis and radish is a favorite at Loring Place. Maison Pickle, 2315 Broadway (85th St) - The "french dip and cocktails" is what they're known for but most everything on the menu is classic American comfort food. Be prepared to roll out of there, especially if you finish the meal with any of the mouth-watering desserts! The decadent 'royale' French dip sandwich with roast beef and foie gras at Maison Pickle. Malatesta Trattoria, 649 Washington Street - Try any of the delicious homemade pastas at this cozy little spot on the corner of Christopher and Washington Street in the West Village. During the warmer months, you can sit outside and people watch. Cash only. Marta, The Redbury Hotel, 29 East 29th Street - Thin-crust pizza, pasta, meats, fish and vegetables — it's all good here! Another Danny Meyer hit with a large, airy space and an open kitchen. A nice selection of wines, beers and cocktails as well. One of the many delicious pizzas at Marta. The Mermaid Inn, 570 Amsterdam Avenue - Always hopping, this Upper West Side seafood spot delivers fresh fare in a casual, fun environment. The Milling Room, 446 Columbus Avenue (at 82nd Street) - I finally made it to this two year old restaurant on the Upper West Side and it did not disappoint. All of the food was spot-on and, oh, that dessert..... WOW! Skate with chick peas and garlic aioli in a saffron broth at The Milling Room. An amazing rendition of a classic. Tart Tatin at The milling Room. Nobu, 40 West 57th Street - I stopped coming here because I had gone too many times and I needed a break (I can't believe I'm saying that but, hey, we all need a break from our loved ones from time to time!) On a recent return visit, I was so happy to be back! I've never had a bad or even mediocre meal here. I'm sad the original location has closed but the food is just as tasty at the new location and at 57th Street. Unfiltered sake with fluke crudo at Nobu 57. Excellent passionfruit margarita at Nobu downtown. Nougatine at Jean-Georges, 1 Central Park West - This more casual sister to Jean-Georges is always bustling. The wine list and cocktails are top-notch and in the summertime, you can sit outside on a beautiful patio surrounded by greenery. 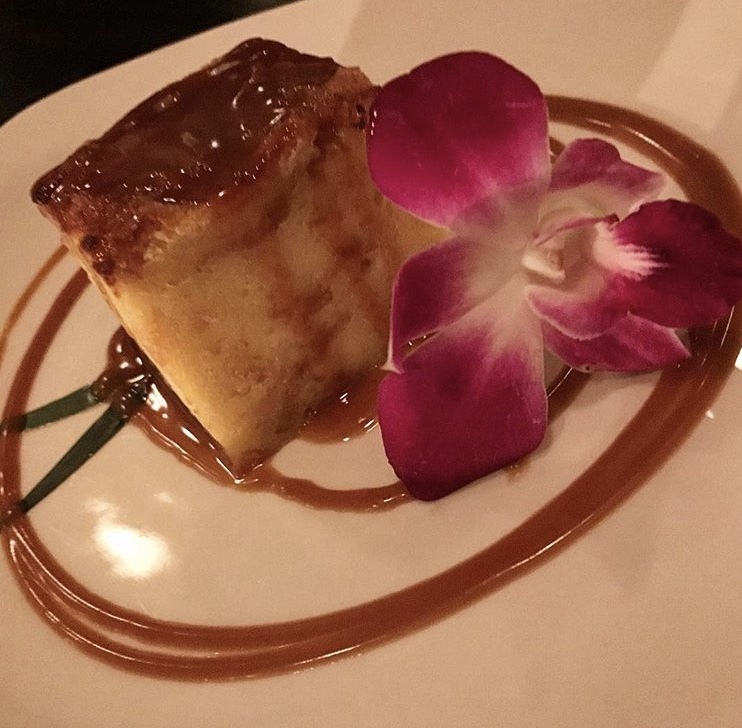 The fish is always cooked perfectly and the butterscotch pudding is one of the best in NYC. Butterscotch pudding under the stars on the patio of Nougatine. Excellent Kubaneh bread and eggplant meze at Nur. Pearl Oyster Bar, 18 Cornelia Street - One of my all-time favorite seafood restaurants that transports me to the coast of Maine. I always order the creamy, bacon-infused clam chowder, the meaty, bursting-with-flavor lobster roll and the best-ever butterscotch parfait. In the summer, I also have the blueberry pie! A transplanted New Englander's heaven! Pizzeria Sirenetta, 568 Amsterdam Avenue (between 87th and 88th Streets) - From the folks behind The Mermaid Inn comes this wonderful addition to the Upper West Side's dining scene. This warm and welcoming spot serves up excellent pizzas, pastas and more. Read more here. Public Kitchen, 215 Chrystie Street - Another Jean-Georges restaurant to hit the scene. If you're into hot new restaurants with good food, this one will fit the bill. If you're not, stay away! It's big and flashy and loud but all the food we had was quite good. Quality Eats UES, 1496 Second Avenue (at 78th Street) A new addition to the group of casual steakhouses which originated in the West Village has a friendly vibe and lots of solid choices besides steak. I particularly enjoyed the items on the raw bar menu and the grilled salmon. The toffee cake at Quality Eats UES could've fed an army and they would have been very happy! Racine's, 94 Chambers Street - This fabulous little restaurant with its hip, Parisian flair, delicious food and friendly staff is a favorite of mine. It's a lot of fun sitting at the small bar overlooking the kitchen to take in all the action if that's what you're in the mood to do. There's an excellent selection of organic and biodynamic wines as well. Make sure to ask for Arnaud's help when choosing the wine and you will be guaranteed a perfect complement to your meal. Or, go on a Monday night and bring your own special bottle when it's BYOB with no corkage fee. And order your own chocolate caramel tart for dessert — don't share this one! — the best in NYC!! It was just announced that Racine's longtime chef is leaving so I am hoping the new chef delivers the same high-quality cuisine. I dream of this salted chocolate tart almost every night! I think it's The layer of caramel that has oozed into my subconscious!! The scallop dish at Racine's. 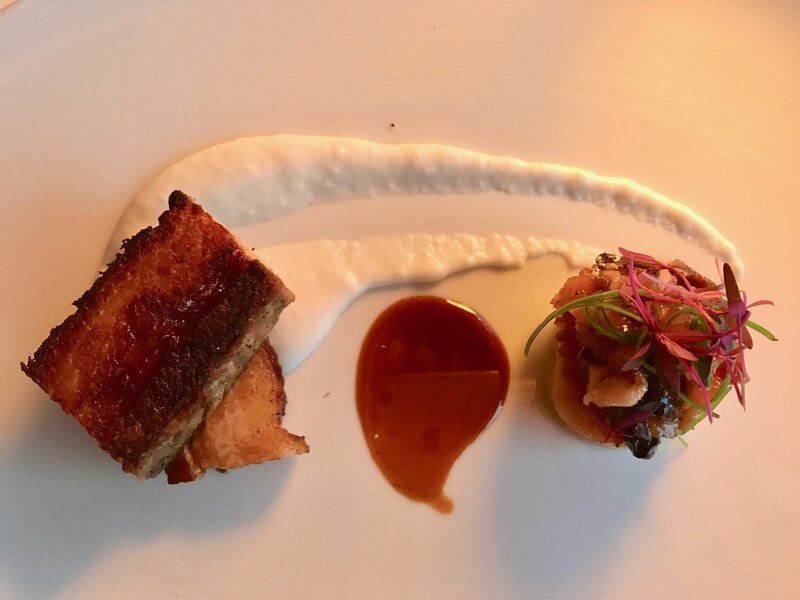 River Cafe, 1 Water Street, Brooklyn - This was my favorite "special occasion" meal of 2017! First of all, you can't beat the views here. I mean, you're in a boat overlooking Manhattan! The service is attentive and friendly, the wine list is outstanding and the food is spectacular! And they gave us the beautiful flower arrangement to take home! Rouge Tomate, 126 West 18th Street - Recently awarded one Michelin star, Rouge Tomate Chelsea is a beautiful space to settle in and enjoy the vegetable-centric, inventive cooking. I love sitting at the long, comfortable bar, relaxing with a cocktail before moving on to one of the many food-friendly wines (say hello to my friend Sarah who is the new Wine Director!). Read more about Rouge Tomate here. Rubirosa, 235 Mulberry Street - Everything is good here but I go when I'm craving my favorite pizza in Manhattan: the tie-dye pizza. Click here to find out why you must order the tie-dye pizza! My favorite pizza in NYC! Tie Dye to Die for at Rubirosa! Sushi Of Gari, 370 Columbus Avenue - The sushi here is alway fresher than fresh and beautifully presented. There are a couple of other locations but I have only been to the one on the Upper West Side in 2017. Fresher than fresh sushi at Gari — baby yellowtail as part of an omakase meal. Toloache, 166 East 82nd Street or 251 West 50th Street or 205 Thompson Street - Creative and delicious Mexican food in a fun, upbeat atmosphere. Great margaritas! Toqueville, 1 East 15th Street - The French-inspired cuisine in this gorgeous, refined setting is delicious! You will feel pampered and love it! Both savory and sweet hits the spot at Toqueville. Union Square Cafe, 101 East 19th Street - Danny Meyer's first restaurant, now in a new location, is still a popular spot for updated American cuisine. Upland, 345 Park Avenue South - This beautiful brasserie always satisfies with its hearty cuisine and upbeat atmosphere. Excellent cocktails and wine list. The bar here is a lot of fun to dine at and I've heard that at lunch they have one of the best burgers in town. Apple tart tatin with caramel sauce and vanilla ice cream at Upland. One of my many birthday celebration spots! Vic's, 31 Great Jones Street - I ate at this casual Italian trattoria once for a wine tasting lunch and the food was excellent. It's on my list to go back. And there you have it. Bon Appétit to you and yours. I wish you a year filled with amazing food, wine and spirits!